Chef Marc Taft digs deeper into a signature subject with FEED, devoted to fried chicken. About the restaurant: Chef Marc Taft's flagship restaurant, The Chicken and the Egg, announces his devotion to that particular protein. FEED’s simple interior is bright and appealing, designed to keep everything simple and cost-attractive. To present the best possible version of fried chicken, Taft goes with Georgia-raised Springer Mountain. Likes: Good food in a family-friendly casual establishment. Dislikes: Getting there: Negotiating The Battery at SunTrust Park is a real trial. Food & Drinks: Order at the counter and first decide which heat level you want, if any. The choices are Southern fried without heat; Atlanta Hot with medium heat; and Cluck'n Inferno, spiked with ghost peppers. 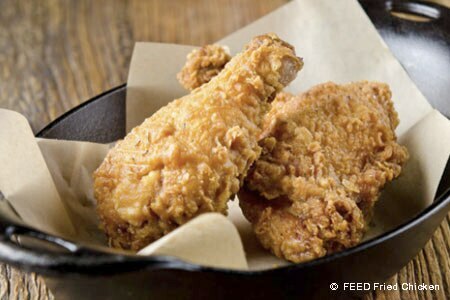 The Southern fried yields a crisp, tasty skin enfolding moist meat, a classical rendition of the dish. Atlanta Hot has just enough heat to cause a couple of hiccups, but not so much that you can't taste the other spices or the meat it flavors. You can get pieces, a bucketful of chicken, a sandwich or even a chicken salad sandwich. Sides include very tasty mac 'n' cheese and Southern-style green beans, meaning they're cooked thoroughly. For dessert, it's banana pudding or a seasonal cobbler. Cocktails, brews on draft and in bottles and cans (including some local suds) and a few wines on tap make up the sipping selections.